Announcing TrekCarePlus for your new bike. 3 years of wear & tear coverage, plus accident insurance! For a higher-mileage rider, TrekCarePlus pays for itself in the first year, and it’s good for three! Plus road hazard insurance too. Can’t lose! TrekCarePlus is a new service you can buy with your new Trek bike that will actually cover damage to your bike from “normal” road use, and most parts that wear out (tires, tubes, brake pads excluded, but chain, chainrings, cassettes… yes, it covers them!). The cost is almost too low to be true. $359 for a $2000-$6999 bike, $499 up to $12,999. That gets you 3 years, and covers most accidents that don’t involve cars, and parts that wear out. What? Did you misread something? 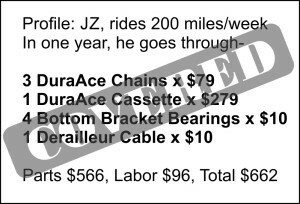 Am I saying that Jeff Z, a guy that rides and rides and rides and goes through chains & cassettes & chainrings like butter (and a darned good guy besides), might bankrupt the company with a program like this? Yes, that’s exactly what I’m saying. How soon does it start? September 3rd. So should you wait to buy a new bike? No, because you can get coverage for any Trek bike purchased in the prior 60 days, meaning a bike today qualifies. Pricing starts as low as $49 (for bikes up to $499.99). Read more about TrekCarePlus in our FAQ. This is one of the best-reasons ever to get a new Trek from Chain Reaction!